According to de Blasio, there are 291,000 NYC-based tech jobs. The city’s tech sector growth is accelerating. You could say that NYC is a natural accelerator. NYC has become a Mecca for startups. It attracts thousands of young people each month to work and create in tech. Everyone I know under 30 is “involved” with a startup. During the afterparty, I asked a group of 20-somethings about the taboo question: “When you interview for a job at a startup, do you ask to see the business plan?” No one wants to sign up with a “loser” startup only to end up back where they started after a year of hard work and late paychecks. But, the cold reality is that only 1 out of 5 new businesses succeed. Therefore, how do you pick a winning startup to work for? Here are the five skillsets considered critical for any business. Although an entrepreneur may have more than 1 of these, we can think of them as personas. Look for them in the next company you interview with. The Visionary — (aka CEO) Every startup should have someone with a vision that sets it apart, otherwise it’s just another taco shack down the block. The CEO defines the company’s mission, inspires the sales force to achieve their goals and gives employees a higher reason than their paychecks to show up for work. The Operations Wizard — (aka COO) This is the person who takes the visionary’s ideas and make them happen within the given budget and resources. This is the firm’s problem solver who gets things done. The Money Man — (aka CFO) He figures out where the money will come from and where it will go. Budget, sales, revenue, expenses and earnings are his domain. he has the power to say no to the next big idea, but everything is at best an estimate. The Marketing Maven — (aka CMO) Every business needs customers and it’s the Marketing Maven’s job to get them. Marketing involves product development, pricing, promotion, sales and customer support. Your company can have the most innovative product in the world but without great marketing, the competition will eat your lunch before the public finally beats a path to your door. The Customer Keeper — There’s one thing that customers want beyond a great product at a good price: Respect! Treat your customers well and the one-time buyer will become a loyal fan making repeat purchases and encouraging friends and followers to check you out. Good customers are the most important resource a company can have. They will resent the insult of poor service long after they forgotten the pleasure of low price. So here’s my advice for young people looking to start up with a startup: Don’t. You’ll be far better off working in a large established company for a few years where you’ll be paid well, might find a mentor, learn how “real” business are run and can leverage your company’s name to open doors. That said – If you can’t resist the allure of the next great disruptive idea; the shiny devices doing marvelous things and the ultra cool work environments, then look beyond those attractions when you interview for a job with a startup. Ask about the company’s business plan. Make sure the firm has the 5 skillsets every business needs to succeed. What has your experience been with interviewing and working for a startup company? Photo Note: The Fool is one of the most important cards in the Tarot. It usually appears at either the beginning or the end of a tarot deck and, unlike other cards, is not assigned a number. It is an ancestor of the modern joker. By it’s use, I do not mean to imply that mayor de Blasio is a fool. Quite the contrary. 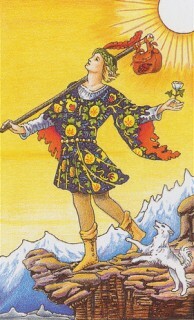 The Fool has the sun at his back symbolizing good fortune. He is a vagabond who travels to the (bleeding) edge with a true companion (the white dog) to warn against missteps. He carries aloft a single rose representing hope. In the Tarot tradition, the card signifies new beginnings -> Startups.